Infective endarteritis is an uncommon complication of aortic coarctation. Its precise incidence is not well established. Aneurysmal formations are well recognized in this setting. We describe a patient with coarctation of the aorta who developed a mycotic aneurysm of the descending aorta just distal to the point of constriction. A 12-year-old boy was referred to the Cardiovascular Surgery Department for aortic coarctation. The diagnosis was made 3 years earlier when a cardiac murmur was discovered during his hospitalization for angina. Surgical treatment was advised but the child was lost to follow-up. One month prior to this admission, the child had insidious onset of fever, fatigue, loss of appetite and pallor. There was no history of recent dental procedures or tooth ache. Blood cultures were negative and he received intravenous antibiotic therapy elsewhere. The details of treatment were unfortunately not available. He became afebrile although his general status did not improve. On examination, the child was ill looking but afebrile. His weight was 32 kg. Femoral pulses were weak and blood pressure was higher in the upper limb than in the lower limb (150/70 mmHg versus 130/70 mmHg). A systolic ejection murmur was audible over the base of the heart and in the left interscapular region. There was no splenomegaly. Clinical examination was otherwise normal. Laboratory data showed anemia and normal sedimentation rate and C-reactive protein levels. Successive blood cultures were negative. Transthoracic echocardiography showed a bicuspid aortic valve without leaflets dysfunction and a slight dilatation of the ascending aorta associated with a marked isthmus stricture. No evidence of vegetation, valve lesion or septal defect was present. There was maximal gradient of 78 mmHg on Doppler examination. Computed tomography scan showed a false aneurysm of 14.2 mm of diameter just distal to the constriction and communicating with the aortic lumen [Figure 1]. A decision was made for a surgical intervention. Through a left postero-lateral thoracotomy, a juxta-ductal coarctation and an aneurysmal formation just below the stricture with inflammatory adhesions were found [Figure 2]. 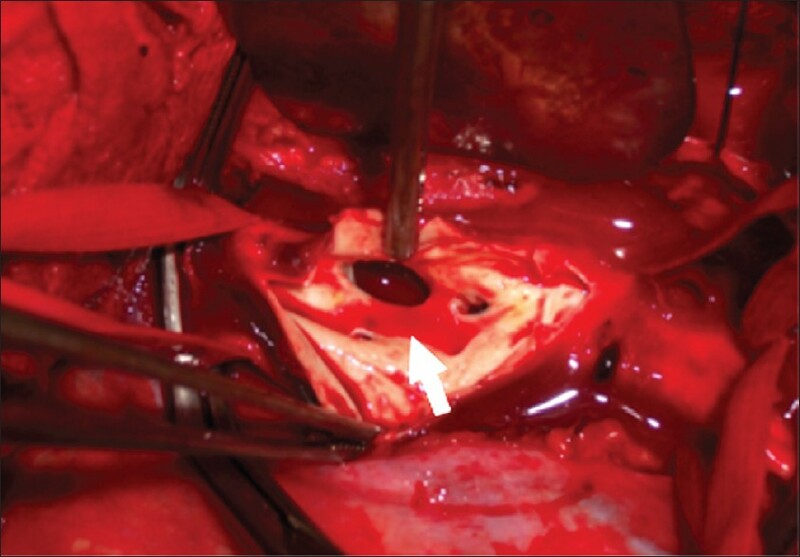 We performed a large resection of the constricted aortic segment and the aneurysmal sac. The descending aorta was replaced by a prosthetic Dacron tube. Bacteriologic cultures of tissue grew Staphylococcus chromogenes adapted antibiotic treatment was given, including Vancomycin 40 mg/ kg/ day and amikacin 15 mg/kg/day during the first 5 days. The postoperative course was uneventful and the patient was discharged after 1 week. The patient needed at least 6 weeks of antibiotics for infective endarteritis. 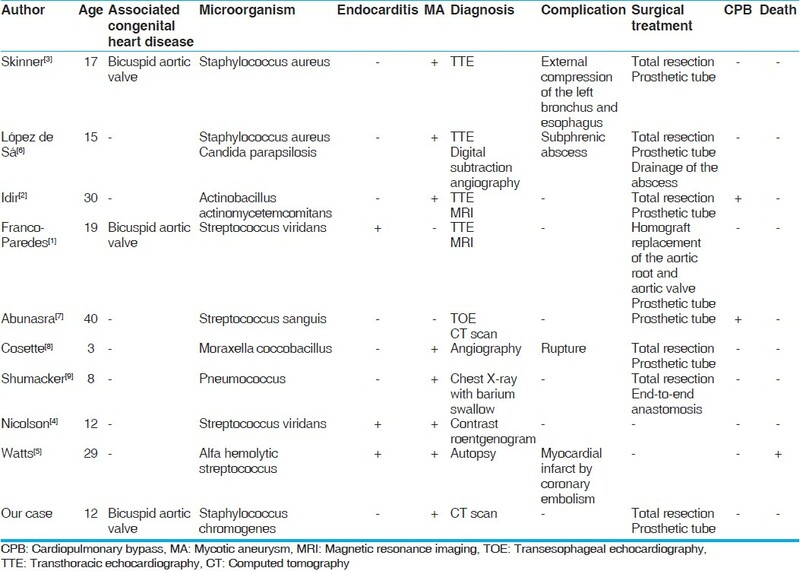 Congenital heart disease accounts for 6-24% of cases of infective endocarditis. In aortic coarctaion, endocarditis and endarteritis remain uncommon, although a few cases have been reported. ,,, Endocarditis affecting an associated bicuspid aortic valve seems to be more frequent than infection on the coarctation itself. Mycotic aneurysm of the aorta is an unusual complication of arterial infection associated with high morbidity and mortality. More than 90% of mycotic aneurysms result from infective endocarditis with infected microemboli reacing the vasa vasorum. However, postcoarctation mycotic false aneurysms originate at the site of previously injured endothelium because of a jet lesion and by direct seeding of microorganisms,  as we can presume in the present case. In fact, we did not find any evidence of endocarditis: there were no signs of intracardiac vegetations or valve lesion on echocardiography. The most common infecting organisms are Staphylococcus aureus and Streptococcus viridans, but several other bacteria have been reported [Table 1]. To our knowledge, this is the first report of endarteritis due to Staphylococcus chromogenes affecting unoperated coarctation of the aorta. The diagnosis is often made on echocardiography, but many mycotic aneurysms are discovered on occasion of complication such as rupture or external compression. , Transesophageal echocardiography is a suitable tool for the diagnosis of endocarditis, which is superior to transthoracic echocardiography. Although transesophageal echocardiography is not usually performed in aortic coarctation, it is particularly suited for detecting endarteritis and aneurysm. In our case, mycotic aneurysm was clinically silent, there was no mediastinal mass seen on the chest X-ray, transthoracic echocardiography was negative and transesophageal echocardiography was not performed. The aneurysm was only revealed by computed tomography scan. Although in our case the postoperative course was favorable, we recommend a close follow-up with echocardiography and CT scan monitoring. In conclusion, Infective endarteritis and mycotic aneurysm can rarely complicate coarctation of the aorta. Antibiotic prophylaxis for endocarditis as well as early surgical management of aortic coarctation should improve the prognosis of such structural heart disease. 1. Franco-Paredes C, Workowski K, Harris M. Infective endocarditis-endarteritis complicating coarctation of the aorta. Am J Med 2002;112:590-2. 2. Idir M, Denisi R, Parrens M, Roudaut R, Deville C. Endarteritis and false aneurysm complicating aortic coarctation. Ann Thorac Surg 2000;70:966-8; discussion 968-9. 3. Skinner JR, Bexton R, Wren C. Aortic coarctation endarteritis and aneurysm: Diagnosis by transoesophageal echocardiography. Int J Cardiol 1992;34:216-8. 4. Nicolson GH. 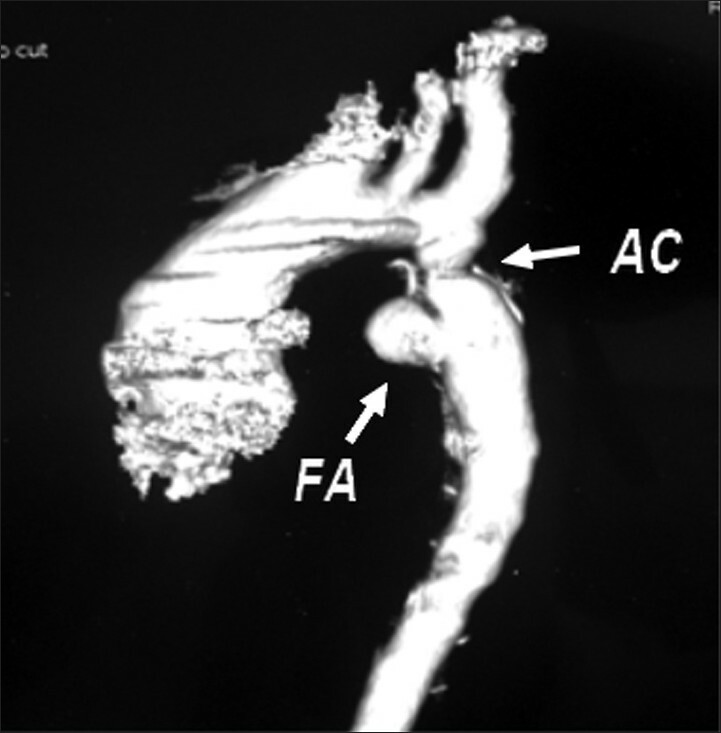 Coarctation of the aorta in a child with arrested subacute bacterial endarteritis and a calcified mycotic aneurysm at the seat of stricture. Am Heart J 1940;20:357-65. 5. Watts RW. Coarctation of the aorta complicated by acute bacterial endocarditis with embolism of a coronary artery and syphilitic aortitis. Am Heart J 1952;43:111-3. 6. López de Sá E, García-Fernández F, Ramos A, Sotillo J, Valencia E, Khamashta MA, et al. Echocardiography and digital subtraction angiography in detection of mycotic false aneurysms complicating coarctation of the aorta. Am Heart J 1988;115;4:898-900. 7. Abunasra H, Hickey M. Unusual complication of coarctation of the aorta. Ann R Coll Surg Engl 2005;87:481. 8. Hess J, Bink-Boelkens MT, Dankert J. Mycotic aneurysm at the site of formerly ligated ductus arteriosus caused by infective endarteritis. Br Heart J 1982;47:103-5. 9. Shumacker HB Jr. Coarctation and aneurysm of the aorta; report of a case treated by excision and end-to-end suture of aorta. Ann Surg 1948;127:655-65. 10. Cosette R, Davignon A, Stanley P. Ruptured aortic aneurysm in a 3 and one half-year-old child with coarctation of the aorta. Can Med Assoc J 1969;100:257- 61. Krieves, M.A., Merritt, G.R., Nichols, C.S., (...), Thompson, M.E., Ing, R.J.